I've just posted the Press Release from the May 1st Coalition. Maybe the attacks on out of staters, Vermont kids, will draw some balanced attention that has been withheld in the attacks on local residents that for the past two years have been routinely occuring at public peace gatherings such as the recruitment center protests, now in their fifth year, on Speedway Boulevard in front of the recruitment center. I will be updating this entry throughout the day today with snippets of info and links to blog entries about the history that I know of per protests and the long list of attempts to have the Tucson Police protect the peace folk's right to freedom of speech. For those of you who can't wait for my summary, my entries on this subject begin in June of 2006. From our allies at the May 1st Coalition-- please distribute widely. There's a lot of weirdness every day in the capital city, but this one pushed the envelope: 13 Iraq war veterans in full desert camo going on "patrol" from Union Station to Arlington National Cemetery. They carried imaginary assault rifles, barked commands, roughly "detained" suspected hostiles with flex cuffs and hoods -- and generally shocked, frightened and delighted tourists and office workers. "How does occupation feel, D.C.?!" shouted Geoff Millard, head of the local chapter of Iraq Veterans Against the War, who previously served on a brigadier general's staff in Tikrit. They cut a swath across downtown, taking imaginary sniper fire and casualties on the grounds of the Capitol and the Washington Monument, scouting the White House, performing mock arrests at the foot of the Capitol steps and a vehicle search on the Mall. At the Capitol, the veterans almost got detained themselves by civilian peace officers with real guns. The vets brought their act to a military recruiting station on L Street NW and concluded with a memorial ceremony in the cemetery. The 12 men and one woman included one veteran of Afghanistan, and they represented the Army, Marines and Navy. They were young, intense, disillusioned. Home from the war, on yesterday's fourth anniversary of the Iraq invasion, they wanted to bring the war home to Washington. They called it Operation First Casualty -- citing the adage that truth is the first casualty of war. The premise of their guerrilla-theater incursion was that, for all the yellow ribbons and "support the troops" sloganeering, life goes on at home pretty much oblivious to what it's like for American soldiers and Iraqi civilians. "When I got home, the hardest thing for me was realizing the war does not exist here," said Aaron Hughes of Chicago, who was a sergeant in a transportation unit that convoyed troops and supplies in and out of Iraq from Kuwait. The gonzo lost patrol stayed earnestly in character for much of the day, which meant creeping down the arcade outside Union Station in formation at about 8:15 a.m. "Danger area ahead," warned patrol leader Garett Reppenhagen, a former Army sniper with the 1st Infantry Division. They held their left arms out straight, like gun barrels, and gripped imaginary triggers with their right hands. He signaled for his men to sprint two by two through the arcade, past the Thunder Grill, to the Metro entrance. Outside the Metro station were about eight civilians with white T-shirts over their winter clothes. In real life, they are antiwar activists. On this day they played suspects and bystanders in a war zone patrolled by an edgy occupying army. Shouts and curses, shoving and arm-twisting, from Reppenhagen and his men: "Don't move!" "Get down on the ground!" "Do I have to shoot you, or are you going to stay still?" The soldiers twisted on the cuffs and adjusted the hoods, then ordered, "Get 'em out of here!" In two frantic minutes the scene was over; the civilians moved on to the next location outside CNN and Fox News, and the soldiers continued their patrol. "Way off the hook," said a man on his way to work. This is the way it is on patrol, the vets said. You can't take chances, which means you can't treat people like human beings. Motorists halted for the strangely alert, cautious, crouching column. Men and women in the workaday uniforms of trench coats and business suits got tangled in the advance. While explanatory fliers were handed out, not everybody got the message. "I don't know what they're doing, but they're in everybody's way," said Janet Ruck, a career counselor in Washington. Upon hearing an explanation, she said, "So they were intentionally getting in people's way. I don't think that people have lost touch or forgotten [about the war]. I don't think this is the way to get people to connect." "At first I was scared," said Maria Rave, a restaurant owner from Maine who saw the platoon reenact visions of a sniper attack, near the Smithsonian Castle. "We weren't sure what they were doing, but it's kind of cool," said Glenn Gebhart, an IT consultant from Rochester, N.Y. "We're all in favor of the message," said his friend Chris Santillo, a martial arts teacher from Alexandria. All day, an alien context was being imposed on familiar streets and tourist zones. The new frames of reference made for little epiphanies. For example, through the eyes of a soldier, potentially hostile cities all look alike. The soldier reduces every feature to threats or places of shelter. "Watch the windows," called Reppenhagen. The windows? That's Goodies Deli. "We got a long danger area!" No, those are the steps and promenades to Upper Senate Park, adjacent to the Capitol. The soldiers took cover behind the marble. "I feel like Forrest Gump, desert style," said Mark Lachance of Philadelphia, formerly a scout in the 1st Infantry, now zigzagging up to the Capitol. 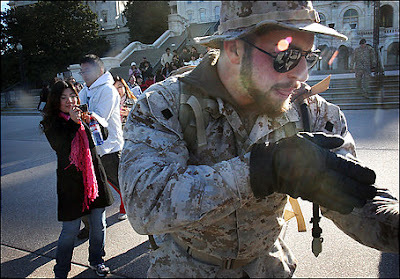 U.S. Capitol Police officers held the patrol on the grass briefly, mulling its lack of a permit, then let the vets go. A mounted Park Police officer approached the patrol. "Do you guys have any weapons?" she asked. They are all members of Iraq Veterans Against the War, a group that claims about 400 members nationwide and calls for immediate U.S. withdrawal. "We are the troops," said Kelly Dougherty, co-founder of the group. "Supporting the troops means not sending us into a war based on lies." After lunch by the Washington Monument -- five of these antiwar vets are vegetarians -- it was back on patrol. The day ended at Arlington Cemetery. They saluted the fallen, remembered dead friends. Then they removed their uniform shirts, a symbolic leave-taking from the war and from the roles they had taken up once more. Many had found it troubling, acting like soldiers again. "I definitely feel it," Reppenhagen said. "We don't want to act like soldiers. We felt we had to for today to help express the honesty of the war. But we want to revert back to being veterans and civilians." It would be nice to get coverage for the antiwar perspective without having to resort to antics.... but we will do WHATEVER it takes to keep the public informed! Do check out Jeanne Moos coverage of Midge in the Plame Hearing. I also love the Rabbit Ear coverage when Gael could see the monitor and was directing Toby's peace sign/rabbit ear placement -- also like the great clip of Sam taking her elbow back from a cop. Disgraced Tom Delay went on television Sunday morning and complained on Meet the Press that "we shouldn't have had what we had yesterday...in Washington, D.C." with people calling for "impeaching the commander in chief." Much as Tom Delay would probably like to see the First Amendment removed from the Bill of Rights, the stark reality that he and the White House faced was a huge outpouring of people from across the United States calling for the Impeachment of Bush, Cheney and other high officials. Feeling the heat from mass demonstrations around the country, Bush was forced to go on national television Monday and "plead for patience" from the people of the United States. Led by a contingent of Iraq war veterans, active-duty service-members, Gold Star families, and veterans from other past and present wars, the demonstration received a large amount of media coverage. CNN featured the demonstration, which the report described as a march of tens of thousands, in its rotation Saturday and Sunday. 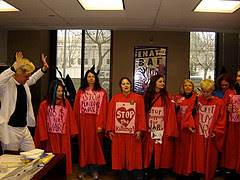 There were hundreds of articles in US newspapers and world wide, and photographs featuring thousands of impeachment signs including, "Guilty of War Crimes, ImpeachBush.org." The major French newspaper, Le Monde, ran a significant article under the headline, "More than 50,000 People Protest Against the War in Iraq," about the March on the Pentagon and wrote that the protestors were calling for the impeachment of Bush for war crimes. The rally was broadcast live on C-span and Al-Jazeera. Ramsey Clark; Cindy Sheehan; Cynthia McKinney; Jonathan Hutto and Liam Madden, co-founders of Appeal for Redress; Iraq Veterans Against the War; Salt Lake City Mayor Rocky Anderson; constitutional rights attorney Mara Verheyden-Hilliard, and others spoke. You can view the rally by going to http://www.cspan.org/ and clicking on the March 17 anti-war rally under the video section. Ramsey Clark's speech is available on YouTube by clicking on this link. Many people who came to the rally after it had begun - some who had seen the huge march at a distance as it crossed over the Memorial Bridge across the roadways and wanted to then join the activity - were blocked by the Pentagon and the police from entering the rally site through a maze of misdirection, road closures and threats of arrest at multiple different locations. March organizers worked to get people in and they and their attorneys went to the site of sudden police confrontations and shutdowns, but many people were still unable to get in including the hip-hop artist Immortal Technique who was scheduled to perform. Ramsey Clark challenged all of us when he spoke at the Pentagon: "We¹ve got work to do. If you thought about what will happen in the next 22 months if we don't act now, there will be a big buildup of U.S. troops in Iraq. That's what the surge is about. It's a permanent surge." And of course we can't forget the secret service thugs who are protecting Hillary from opposing voices. Geesh, no wonder the Hillary/Apple mashup made by non-Obama folks is getting so much play.